Posted on Wed, Feb 8, 2012 : 5 a.m.
William Feather, a publisher and author who died in 1981, said, "Concentrate on your job and you will forget your other troubles." Concentrate on your bridge and you will forget your other troubles. But you may easily be distracted, especially in the card play, if you fear you have done something wrong during the auction. This deal provides an example. Look at the East hand. With East-West vulnerable, South deals and opens one heart, West makes a weak jump overcall of two spades, and North leaps to four no-trump, Blackwood. What would you do? 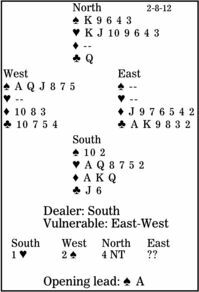 At the table, East passed, South rebid five hearts (two aces), and North raised to six hearts, which was passed out. West led the spade ace. What should East have discarded? North's use of Blackwood with no aces and a void was debatable, but he hoped that if South had only two aces, neither would be the diamond ace. East had a tough decision over four no-trump. If West would have read five no-trump as showing two long minors, that would have been sensible. Alternatively, East could have overcalled five diamonds, planning to show his clubs next. Here, though, seven of either minor would have gone down three (minus 800 after South doubles), and six hearts can be defeated. What is West going to do at trick two? He will lead a second spade for East to ruff, never guessing that East has two voids. But East knows that he cannot ruff. He must not lose concentration; he must discard the club ace.